The latest installment of an ongoing collaboration between RPS and Dead End Thrills brings you a look at the recently released Betrayer. Just a moment while I stand and address the group. Hi everyone. *deep breath* I am a Monoholic. One whiff of vintage Monolith Productions and I’m back in the throes of a FEAR bender, or in a caravan park somewhere fighting ninjas disguised as Wiltshire police officers. 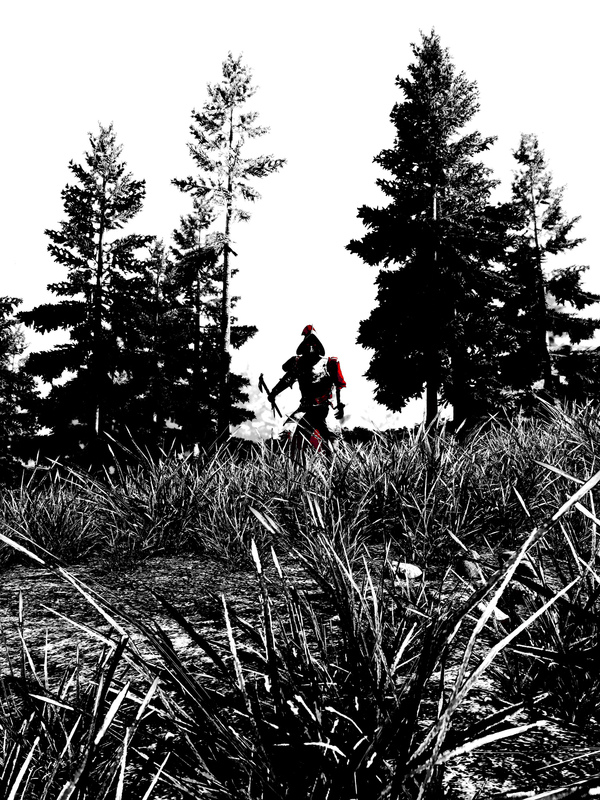 And now this: Betrayer, an action adventure from six Monolith veterans born again indie and calling themselves Blackpowder Games. Quick, someone, chuck me that copy of Shogo or I’ll burn your house down. 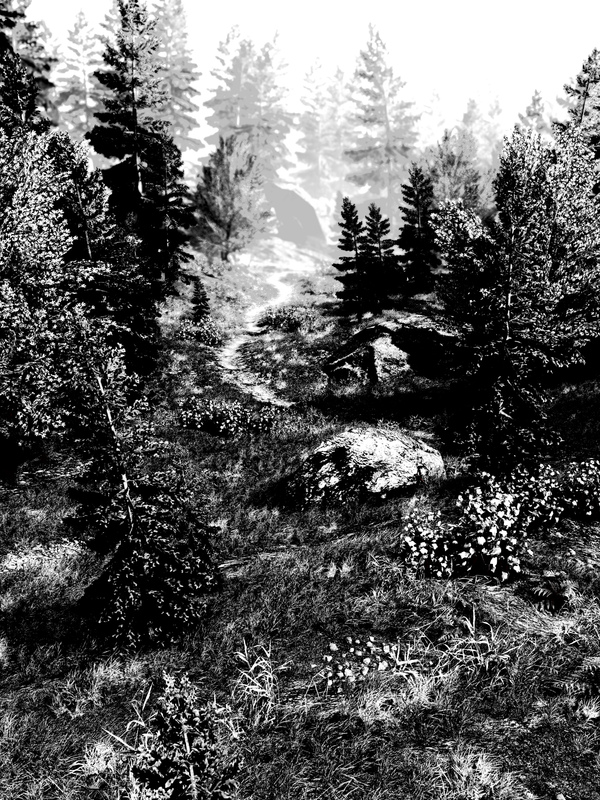 Betrayer may be – or maybe not, thanks to some new sliders – in stark black and white, but shades of the confetti-coloured No One Lives Forever seep through. 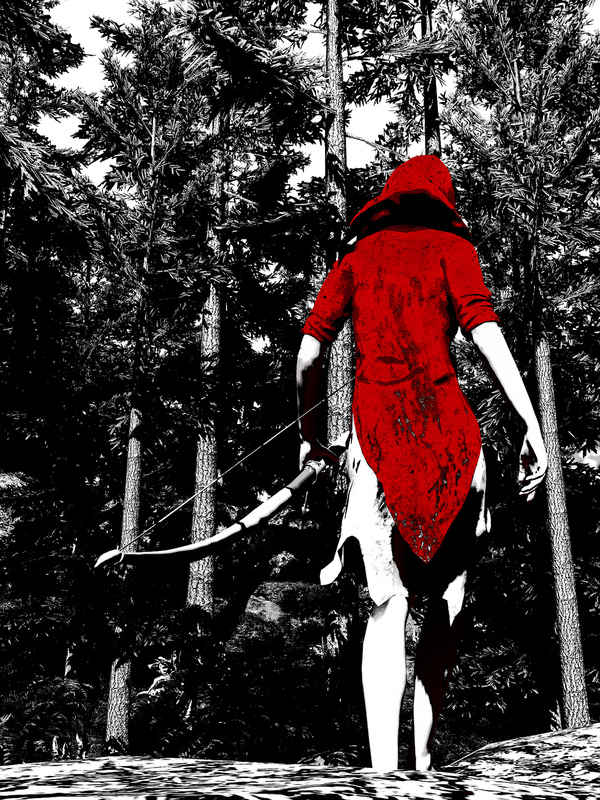 Weapons like the tomahawk feel kinda kooky in the hands of a videogame, and objectives come thudding into nearby woodwork via arrows shot by a mysterious young lady. All in a place that’s equally unlikely: the New World of 1604, miles and centuries from the nearest FPS. 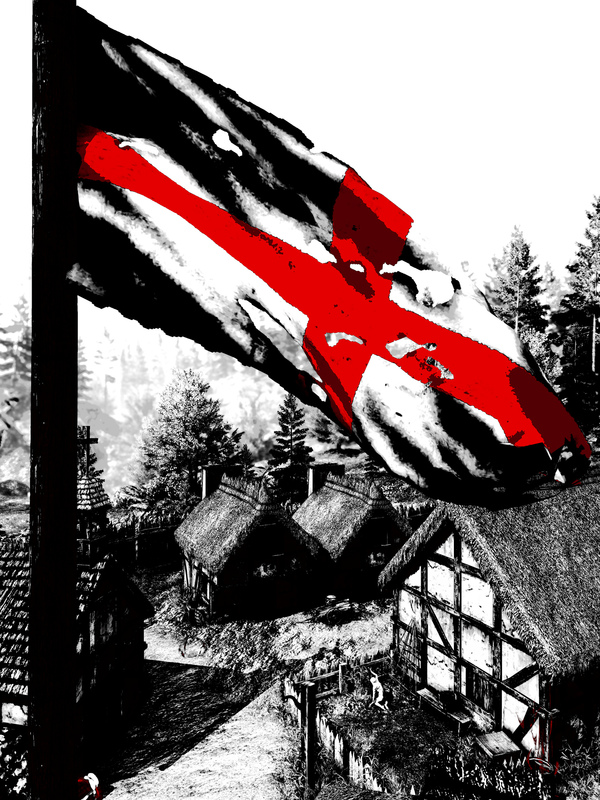 Plenty’s been said about the game and how it borrows the ‘lost colony’ of Roanoke legend for its unpredictable ghost story. What shines in the Early Access version – the game is 70 per cent complete, they say – is a strong sense of place that feels particularly rooted in FEAR. The way the rustic colony seems to grow from the environment, exposed to whatever shapeless terrors blow through its timbers, reminds me of one of my own favourite movies, Ravenous. So that’s two favourite things lacquered in a rather brave and divisive – the best kind, right? – art style. Not bad for a tenner. This is the first of three conversations I’ll be having here with creative director Craig Hubbard and art director David Longo, the second two covering FEAR and the No One Lives Forever games. I promise to stay calm on the outside. Whatever beef you might have with games that seem inspired only by other games can be left on the doorstep should a Blackpowder member, say, invite you to dinner or forget to renew that restraining order. Hubbard “can’t wait” to see A Field In England, he says somewhere in the middle of an almighty great list of books and movies that aren’t all so plainly relevant to Betrayer at a glance. Not to say that developers elsewhere don’t read or nuffin’, but few find the opportunity to channel inspirations so directly into their work, if at all. Hubbard waited until a weekly meeting to surprise his colleagues with Betrayer’s scratchy new India ink look, but it didn’t happen overnight. 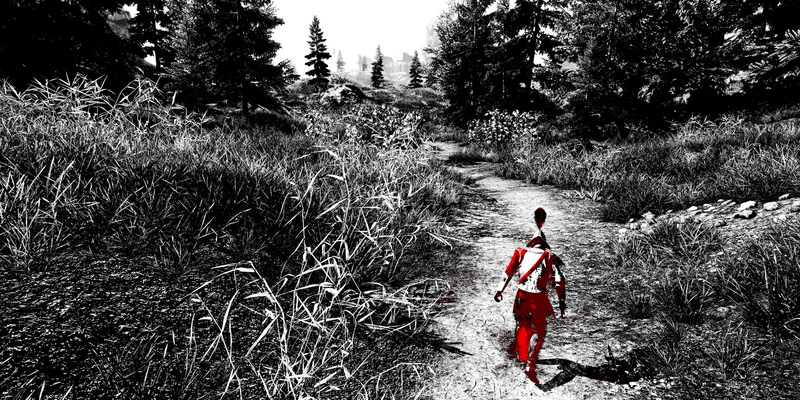 Some arguments between the game’s colour and contrast had to be resolved before they clicked. Hubbard: “The way I tend to test things I’m unfamiliar with is to set the ranges to the extremes to get a sense of the overall spectrum. So I cranked some values all the way down and the game became pitch black, then cranked them all the way up and ended up with a harsher version of what we went with. 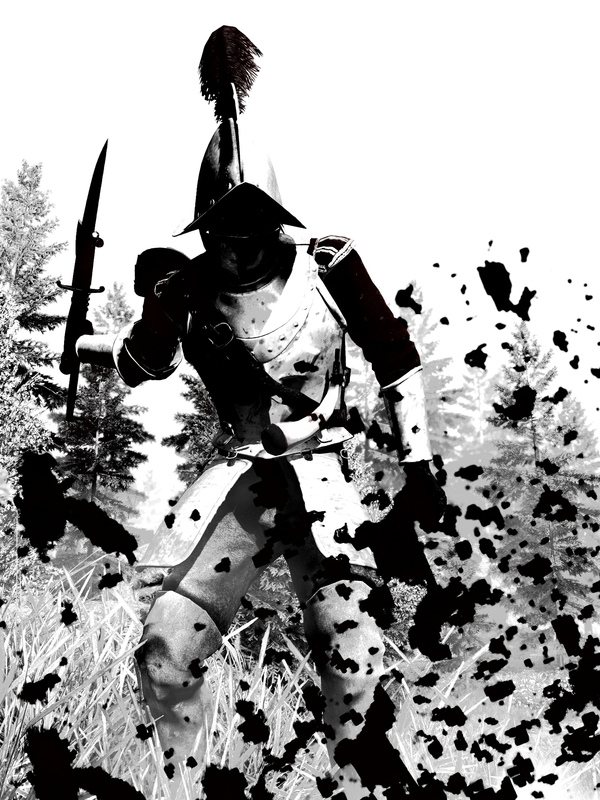 It reminded me of Frank Frazetta’s ink sketches. Growing up, I had friends who preferred Boris Vallejo, but Frazetta was a storyteller. Anyway, we did a bunch of experimentation after I chanced upon the high contrast look, but while a lot of them were prettier, they tended to feel a little contrived. None of them changed the way the game felt, so they just seemed a bit gimmicky. A recent patch has given players uncommonly fine control of Betrayer’s look, even rolling the game back to naturalistic colour if preferred. But if the look is now optional, assets having to work in both India ink and colour, is there a danger of having to bastardise those assets to satisfy both demands? Would a determinedly mono version not feel stronger and more stylistic? Hubbard: “We’ve found that people, before they’ve played it, will be more put off by the look. Once they actually get their hands on it and can ‘feel’ it, they adapt pretty quickly. When we were at PAX we’d see people start playing with the sliders, and then they’d go back to the default look because they thought that was best experience. That’s kind of what we’re hoping will happen. Jumping on the J-horror bandwagon just as its wheels were falling off, FEAR invited scepticism but revealed a mastery of juxtaposition and player manipulation. 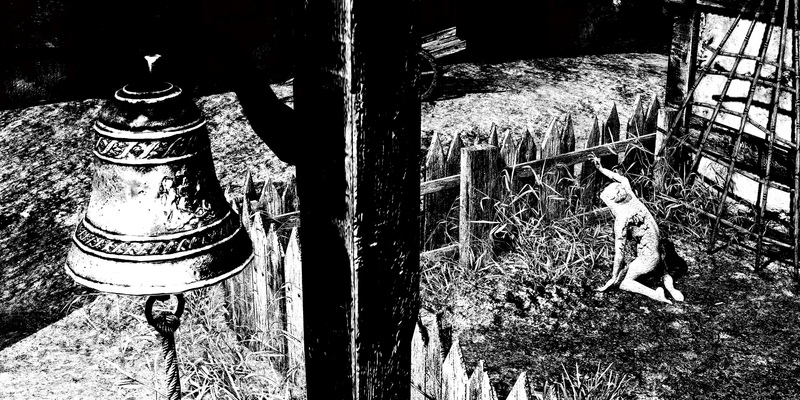 Both are evident in Betrayer, where encounters and discoveries aren’t always as malignant as appearances suggest. Some don’t even suggest anything, in fact, until they’ve lured you in for a closer look. Camouflage and imagination are only amplified in this high contrast world. Hubbard: “One of the things I found as I was playing is that I felt much more like my brain was working harder, and it felt more engaging as a result. There were some different elements in the first fort initially: there were some stocks, and you’d kind of have to strafe around it from certain angles to tell what it was. There’s sort of a deciphering process to that where the world resolves as you move, rather than just being instantly readable. That contributes to the tension in a way that’s really interesting. You always want to try and surprise people, and we started on that with FEAR. But you realise when you start to make an interactive experience that so much of what works so well in those Japanese and Hong Kong horror films is because the camera is in the right place to see the right thing. When you’re trying to make it interactive and not do it with cutscenes, you realise how hard that is. So a lot of it is trying to get a draft of the game done, then playing through and just looking for opportunities to do it, and we’ll be doing that with Betrayer. Hubbard likes to talk about how the almost surreal churn of rifles, tomahawks and clubs that goes for combat in Michael Mann’s Last Of The Mohicans has inspired Betrayer’s use of weapons. Like FEAR, this jazzy violence then counterpoints elements of mystery and horror no less inspired by the movies, keeping players on their toes. Hubbard: “A lot of it comes down to: what weapons do I want to use in a game? Everybody on the team thinks this way and contributes ideas, and then the ones that sound coolest are the ones we do. On Betrayer it’s actually very much the case that the time period was chosen by the weaponry, weaponry I’d personally been wanting to put into a game for a while. The Betrayer team has a track record with ghosts, of course, and all the hoodoo voodoo they make our graphics cards doodoo. You’d be right to expect different in this game. The ghosts here feel more corporeal than your common or garden apparitions, as if plucked from one of those creepy daguerreotypes of the late 1800s. BioShock aside, it’s surprising how few American videogames are actually about America. Compare this to the more regularly introspective content of games from Japan or the Ukraine. It leaves Europeans like Rockstar North and Remedy to put their own spins on the American way of life, gaining through artistic licence what they lose in authenticity. The Seattle-based Blackpowder team is no stranger to this foreigner’s advantage, even when dealing with local history. Hubbard: “I grew up watching a lot of European horror films. One of my friends, his dad was a dubbing director in Italy, so we’d always watch these really bad Italian horror movies. Sometimes they’d be set in New York, which was obviously just somewhere in Italy, but that actually added charm to it, and hopefully there’s a little bit of that in Betrayer. Alan Wake is an interesting one because it’s set here. It’s obvious that they came here and did some photoshooting and so on, but it’s sort of off. It’s probably very similar for somebody from one of the countries we visited in NOLF. You can see [Remedy] cared about it and did their best to represent it, but it’s off in a way that’s probably even more interesting for us. We don’t have a budget, so we weren’t able to go to Virginia for Betrayer. Virginia at the time [of the game] was everything from New England to Florida almost, so we’re a little bit vague about where the colony is set. But we still tried to capture enough that there’s a specific sense of place. An almost pseudo-3D game at times, as comfortable on paper as on the screen, Betrayer then throws a curveball with its depth-of-field effect. Appearing suddenly at a distance close to the horizon, destroying whatever detail is in those far-off hills, it’s hard to tell if it’s painterly or photographic – or even necessarily good. Tagged with Blackpowder Games, dead end thrills, feature, Betrayer.